We have a new page of important news which will be updated regularly. Please click here. Originally founded in the summer of 1910, our association works on behalf of member beekeepers, providing opportunities to learn the craft and science of beekeeping. Equally important, we provide a social outlet for members to meet with fellow beekeepers - opportunities to share tips and tales. We are blessed to have many excellent beekeepers who are always willing to share their knowledge and experiences. Our association is committed to supporting the native dark bee, Apis mellifera mellifera. We are affiliated to our national body, the Federation of Irish Beekeepers Associations (FIBKA). We provide our members with classes and support to attain FIBKA academic and practical certifications. The Kevin Griffin apiary is located near the M1 roundabout at Junction 16, where members can come and gain practical experience through the beekeeping year. We also hold regular lectures on all aspects of beekeeping. Members and interested non-members are always welcome to attend. Asian hornets in the UK! Asian hornets have really become a problem in the UK, with seven sightings in 2018 and four nests destroyed, in Hampshire, Cornwall, Lancashire and Yorkshire. Please make yourself familiar with this invader since unfortunately it's only a matter of time before it gets to Ireland. The Beginners' apiary sessions continue at the Association Apiary (known as the Kevin Griffin Apiary) on Tuesday 23rd April, 2019 at 7pm. If you have a bee suit, gloves and wellies bring them with you. If you have any questions, bring them along too! Some of our experienced beekeepers will be on hand to help you in any way they can. The microscopy course is ongoing on Thursday evenings. The Improvers' Course with Eoghan Mac Giolla Coda is continuing with a second indoor lecture on Tuesday 23rd April 2019 at 7.30pm at the Market House, Main St., Dunleer. This will be followed by practical sessions at Eoghan's Richardstown Apiary commencing on Tuesday 30th April, 2019 and the following 7 Tuesdays (weather permitting), i.e. 8 sessions in all. On 25th April at 8pm, our own Paul Boyle will be talking on From Super to Supermarket. As most of you know, Paul is a Honey Judge, so there isn't much he doesn't know about honey. On Sunday 5th May at 3pm, a plaque celebrating Turlough Butler O’Bryen, a.k.a. The Bee Man of County Clare, who was born and grew up in Ardee, will be unveiled in Ardee. The plaque will be placed on the wall beside the statue of Cuchulainn holding Ferdia which is beside the car park, Bridge Street, Ardee (on the left hand side as you drive into Ardee from Collon). This will be followed by refreshments and a talk by Jim Ryan about the life and times of Turlough Butler O'Bryen in a local pub/restaurant. You have probably been aware that An Beachaire is available in an online version on the FIBKA web site. Now the site also has back issues of the UK BBKA News online, so there's plenty to read. FIBKA held an EGM on 30th March where it was decided to restructure as a CLG rather than an unstructured federation. This is the first step to recreating FIBKA as an organisation suitable for the 21st century. Membership is long overdue. If you have not paid, you are no longer covered by insurance and you don't receive An Beachaire. Send a cheque with your details to the secretary (see below). Pay online in our online shop. Bank transfer to our account - IBAN: IE47 AIBK 9324 5028 6971 39 (BIC: AIBKIE2D), but be sure to let the secretary know! The secretary will be happy to accept your membership fee at any lecture. As most of you probably have heard, one of our members, Philip McCabe, President of Apimondia, passed away on 20th October. 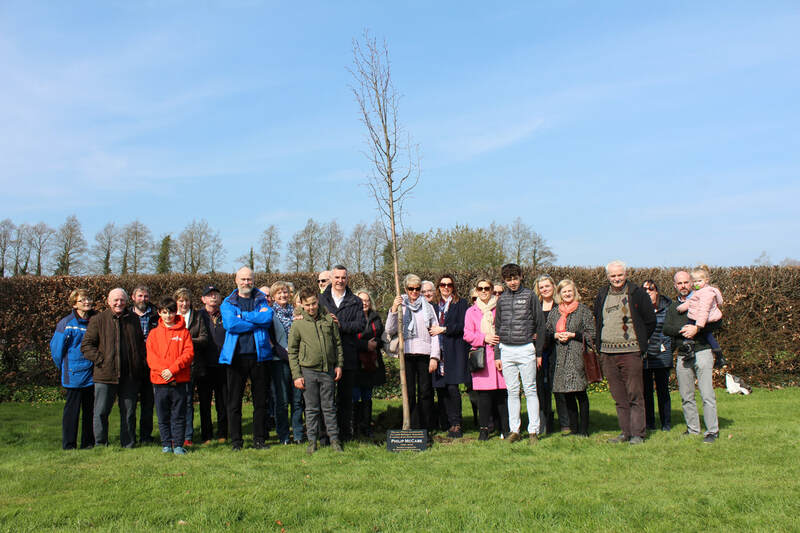 Last Saturday, 6th April, we held a tree-planting ceremony in An Grianán in Termonfeckin, when a tree was planted in his memory.​ There are some photos on the event page. Despite his busy role with Apimondia, Philip was always generous with his time to all beekeepers, and has spoken many times at our events. The photo below is of him talking to our 2018 beginners' class. His passing is an enormous loss to beekeepers, not only in Louth, but across the globe. All lectures start at 8pm in Teagasc, Dundalk (see map). Beginners are welcome and admission is free. See the map below if you need help finding us.